"I think referees need help. The game has become so quick, and there is so much going on off the ball." "It is the one thing this association just can't seem to get right and that's officiating. Good officiating where all the officials are tuned in to what is going on around the place." "Once again, the linesman is doing absolutely nothing." The role of inter-county referee has never been as difficult. This era of elite-level athletes fixated on the sole goal of results transmits to the crowd and the technological boom means a mistake can instantly be identified and replayed 100s of times from several different angles. Yet misinformation is widespread in this debate. The duties of the linesman, which are buried 20 pages into the referee's handbook, are limited to the following: signaling an out ball and which direction, controlling substitutions and notifying the referee of a foul during a break in play. Much of GAA discourse is awash with sweeping statements about the state of the game or standard of officiating. Pundits preach from the pulpit and the congregation repeat verbatim. It has always been this way and thus little has changed; it is time to have a reasoned discussion about referees in our game. The referee is a reluctant necessity. The sport needs them to operate. This is the reality of the situation. In 2004, the GAA introduced experimental rules which were trialed during pre-season competitions and the national leagues. These included the sin bin, permitting lifting the ball off the ground in football and allowing linesmen to draw the referee's attention during play to any fouls that merit a red or yellow card. These trials were not welcomed and eventually discarded. It was discussed by the referee's committee to encourage more linesmen communication in 2011, but it again proved convoluted. Referees do not pick their linesmen and they are often in competition with each other for big game appointments. In circumstances where the linesmen interjected and was wrong, which did occur, the referee was blamed. Today, a linesman only interjects during a break in play for a bookable offence. The entire organisation of GAA referees needs a radical overhaul. Gaelic football and hurling are operating at different wavelengths, with separate rules, speeds of the game and punishments. A clearer divide between referee feedback and regulations for each sport is now necessary. Games evolve, officiating must too. The current level of education for players, managers, supporters and lower level referees is insufficient. A significant portion of the GAA fraternity do not know the rules. The practice of referee assessor reviews being the sole platform for feedback is meager. It is time quality officials sat down with rookies and worked through video with improvement in mind. The same goes for inter-county teams. For years, World Rugby has allowed referees to visit training grounds and facilitate a better understanding of how the laws of the game are applied. This is an obvious solution to resolving any misunderstanding. This applies to supporters as well. 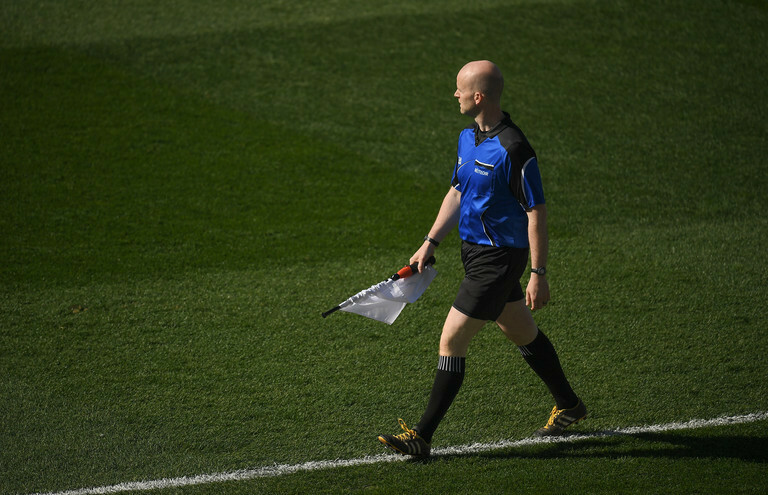 The Sunday Game or Sky Sports GAA could significantly enhance the viewers' experience and education by including referee experts to explain the official role of the linesman or clarify the advantage rule. By doing so, the tedious outcry against refereeing decisions are dramatically reduced. We could suddenly start to analysis games rather than ignore them. When mistakes happen, the instant response should be why did it occur and how to avoid them in future. Speaking on Off the Ball AM, Eamonn Fitzmaurice highlighted linesmen: "They're rivals of the referee other than on match-day. They want to be inside in the middle themselves." Assessors should pay particular attention to the entirety of match-day officiating. After the national league and before the championship, the CCCC organised a briefing in Croke Park for the media to explain and clarify new rules. The room was shown a series of incidents from the league and asked to adjudicate on them. Sometimes there was a consensus, often the room was split. It demonstrated the complexity of the officiating the modern game. There are various issues at play. The pace of each game, hurling in particular, will soon reinforce the idea that two referees are a necessity. The length of training courses in several counties is too short to be comprehensive, the process of upskilling is too slow and the lack of clarification when mistakes are made only heightens the hysteria. The time has come to have an adult conversation about this. Screaming 'do your job!' doesn't help, it's more complicated than that.